At Wine Country Properties, we believe in serving you by being responsive to your needs and by providing the best location and atmosphere to make your vacation memorable. Located just ONE BLOCK off our famous 3rd Street - our Wine Country Farmhouse is perfect for those interested in staying right in the mix of all that is McMinnville. Within walking distance you will enjoy 17 wineries & tasting rooms, 34 unique restaurants, 7 tap rooms & breweries and wander 14 strollable blocks. The Evergreen air museum, space museum and water park is less than a mile away as is Linfield College. Also an easy drive or walk from the house is the McMinnville Aquatic Center, which has adults/kids swimming, spa and a weight room for $4 admission. This circa 1911 home has been lovingly cared for and features a beautiful country kitchen, equipped with all the necessities, furnished in the period of the home and roomy for group cooking and gathering. There are two bathrooms in the home, one upstairs and one downstairs. The downstairs bath has a tub/shower unit and the upstairs bath features a roomy tile shower. Three luxuriously furnished bedrooms are available (two queen, one king). One bedroom is located downstairs and is furnished with a queen bed. Upstairs bedrooms feature an additional queen and king sized bed. The well landscaped back yard is fully fenced and is great for familys and pets. There is a large patio area with a gas grill, patio furniture and propane heated lamp so you can enjoy the outdoors into the evening. Guests will enjoy this professionally decorated home which features an eclectic mix of new polished pieces, local art, and treasured antiques. The home features Wi-Fi, cable and also has a DVD player. For the convenience of our guests we also offer the use of a washer/dryer located in the utility room. We're excited to announce that the Wine Country Farmhouse has received some recent upgrades including: new master bedroom carpet, master bath upgrades and kitchen upgrades! She had the Wine Country Farmhouse…he had the Walter Link House, and this is how Anita Borgaes and Larry Stevens met. Well, actually it was at the UFO Festival, but that’s another story. The result was another Vacation Rental, and now another one along the way. Both are natives who grew up with the wine industry; Anita picked grapes during harvest on one of the first vineyards in Dundee, Larry was raised on a farm in what is now the McMinnville AVA. Like Salmon, they returned after exploring the world to pursue their passion in their hometown: preserving historic properties and sharing Oregon Wine Country with the world. By joining forces—with Anita’s background in real estate and Larry’s background in construction—they have created a solid team in the growing family of Wine Country Properties. Wine Country Farmhouse located at 930 NE 2nd St. is Anita’s first VRBO. It was chosen for its excellent location (one block off 3rd St.) and turn of the century charm. We believe that if you are going to wine, dine and enjoy the downtown festivals, you should never have to drive. Those are the two things all of our locations have in common, character and walkability. We know you will love this house as much as we do. 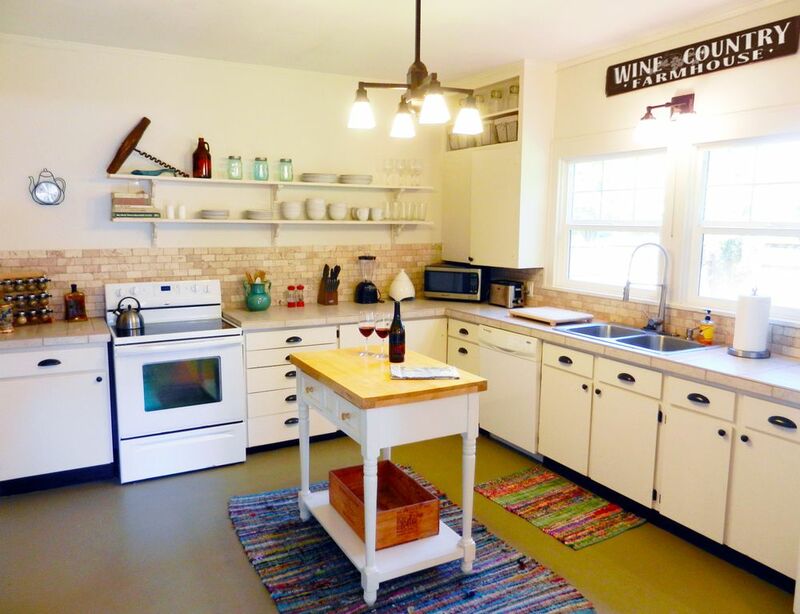 The Wine Country Farmhouse is located downtown, you never have to drive. Yes we have air conditioning. It works great. Please don't over load the dryer. It will take twice as long for everything to dry. There is a drive way and parking in front of the house on the street. The living room is well decorated and has comfy furnture. Relax. The dishwasher works great. Just please remember to load it and start before you leave. Otherwise, this could really stress our cleaners out if we have a same day turn and time is limited. The refrigerator is big with double doors. One side is the freezer and the other side is the fridge. Large enough for big pots and pans if you just made a feast. The stove is a flat cook top with 4 burners. It is easy to clean, which was a good choice on my part. Thanks Anita! The oven is connected to the stove and it's self cleaning. If you do a ton of cooking and everything spatters - can you set the self cleaning before you leave...? Thanks a ton! The microwave is located on the counter and is small. It is really designed to heat up your doggy bag left overs. Chow Down! Yep, we have a coffee maker & filters - but you have to bring your own coffee. If you're lucky you might find Starbucks from a generous guest - but you can only blame yourself if you find Folgers. Yes and the toaster is simple. We have a rack of spices, salt & pepper. Pantry items are left behind from the good will of past guests. But if you leave a half eaten, clean looking birthday cake - don't worry, I will eat it. Yes we are stocked. I have been to VRBO's where they sleep six and they only have six plates and six forks. When you are trying to cook - that's a bummer. Don't worry, we have you covered. The dinning room is off the kitchen, open to living room, seats 6 & more if you like each other. The 1920's antique table was left behind by a college roommate - she says she still wants it back??? We have Cable TV with over 300 channels and HBO on Demand. High speed internet & Wifi. Plenty of backyard lawn space with a fenced in yard. Great for kids and dogs. Covered patio area & open patio area with outdoor furniture and umbrella. Located 1.5 hours away from Mt. Hood Ski Resort & Mt. Hood Meadow day & night sking. There is a bedroom and bath on the lower floor. It depends upon on your situation. Just give me a call to discuss and I will give you the straight facts. Hope to hear from you. The property was very nice and clean. It is cuter inside than the pictures. The beds and pillows were comfortable. There was ample towels, extra sheets and blankets. Super convenient and walkable to restaurants and coffee. The only complaint is there seems to be quite bit of traffic on 3rd street. Met up here with my friends from Idaho (I'm from California) for a few days of sight-seeing and wine-tasting. The house was in the perfect location - literally a 2 minute walk to town where there are tasting rooms and great places to eat. Everyone we came in contact with was truly super friendly! The house is cozy with a large kitchen and sizable back yard. The yard has a table and chairs for alfresco dining and a large BBQ which would be great during the warmer months (it was still a little too cool for us to spend much time outside). My bed in the downstairs bedroom was super comfy, as was the larger king size upstairs my friends used. We didn't need, nor use the third bedroom, but if the other two are anything to go by, I'm sure it is comfy also. The living room/dining room areas were perfect for the three of us to play board games or watch TV in the evenings - HBO was a plus!. I will definitely keep this one on my list to visit again! This was not my first time staying at the farmhouse and it won’t be my last! This place never disappoints! Clean, comfortable, and within walking distance of 3rd street. Couldn’t ask for more. LOVE! It's hard to feel settled (especially with a 2 year old) when staying away from home, but Wine Country Properties has it figured out. SUPER clean, comfortable, warm, homey -- really all you could want for a vacation home. I don't like feeling like I'm staying in someone else's house, but also don't want to to feel like I'm in a hotel. Anita has found and mastered that fine line. The layout of the home is great -- The kitchen is large with a small bar. It was great how we could all be in the kitchen while I was cooking. The dining area is right off of the living room, so the adults were able to play games/talk while the kids were in ear shot/eye sight. The upstairs has a big open room where our daughter could play & a little working nook for us to catch up on email. It's really a great space to utilize if you're trying to straddle vacation and work. There are two huge floor length mirrors which are soo nice when you're trying to get ready for an evening out at one of the wineries. WCP clearly caters to a great customer experience. I have the same great experience at all of their properties. We visit Mac often because it's a quick getaway. Tons to offer, family friendly, and has that boutique feel. We only stay at WCP! The property was very charming, clean and within walking distance to many places. We had a great time and really enjoyed the coziness of the home and the great neighborhood with many nearby restaurants, boutiques and wine shops. My husband, one year old and I loved our stay. Anita was a spectacular host. Thank you! What a wonderful house and location! The farmhouse was a perfect getaway for my little family. The layout was perfect for my one year old to cruise around but also had enough space for him to nap while other family fun was going on. It’s only a short walk from down town so there is always something to do! We felt we had everything we needed and more. Thank you for a wonderful stay! The McMinnville Granary District is located on the east end of downtown (8th & Alpine). Home to 10 wineries, breweries, tasting rooms, restaurants, day spa & salon, coffee roaster, shopping & more. This is a casual place where you can bring your dog, eat indoors/outdoors and be entertained by music and events throughout the year. If you are into exploring McMinnville, this is a MUST DO to put on your list. The old timber barn with open beams and rustic wood work has been converted into a micro brew pub. The menu features wood fire pizzas, tasty burgers and fresh salads that pair well with their craft beers and local wine selection. If you are into a little music, check out their Brews & Bluegrass open jam session Tues. nights 6pm. If you are a UFO attendee, the UFO parade on usually in May, the 3rd Sat. of the month & ends at the Grainery District. The place is hopping with people all dressed up in their UFO garb. If you are an Oregon Brews & BBQ supporter (local fundraiser for St. Joseph), the Grainery District hosts the event every year - the 2nd weekend in Sept. Over 35 regional brewers, music and lots of BBQ. May thru Oct. there is a Farmers Market on 2nd and Cowls St. every Thursday. Long term guests are welcome during our low season. Guests staying 30 days or more - there is NO lodging tax. Guests staying 30 days or more - cleaning fees vary depending upon length of stay.